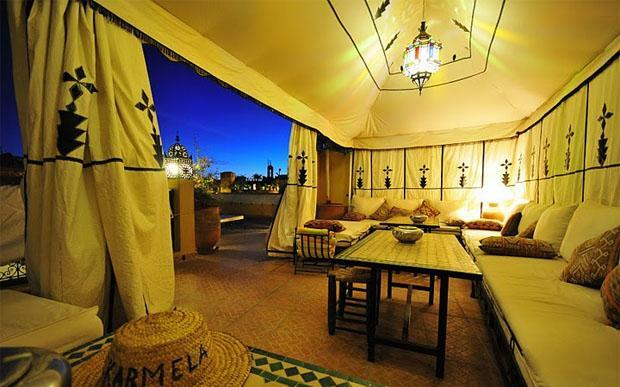 If you want an exotic accommodation while on a vacation to Morocco, which is both an unusual and historic place in its own right, then staying in a riad is the just the ticket. Riads will surely prove to be the hidden gem, and provide you with the taste of real Morocco, free from Westernized hotel chains and other touristy accommodations. “Riad” is an Arabic word which means “garden”, and once you enter through the door, you will see these palacial dwellings get called that! Riads are the very image of cultural immersion: Though there are various great luxury hotels in the country, staying in riads offers a traditional experience that lets you get a taste of the history and culture of the country. In all traditional riads, guestrooms are arranged around a central courtyard/garden, which is built to provide a haven to suit the hot climate of the Saharan region. You’ll find that it is a tradition to have four lemon and orange trees in the garden and to adorn the walls with zellige tiles and tadelakt plaster. Some larger riads also have their own hammam spas. Marrakechi riads Serve Alcohol: Being an Islamic country, Morocco has strict laws regarding sale of alcohol, especially in the walled city. However, riads are permitted to vend alcohol to guests to allow them to sample the local brands. But, you should keep in mind that all riads stop serving alcohol during the holy month of Ramadan. Staying in riads would keep you closer to attractions: If you wish to stay in middle of the action when on a holiday to Morocco, then the best way to do so is to stay in a riad. Most of the big luxury hotels are located outside the city, whereas riads are the only tourist accommodations available within the walled city. Thus, staying in a riad will keep you close to all the action, whether it is the souks, Djemaa el Fna Square (which is the central point of the city known for its exciting nightlife), traditional dancers, exotic food stalls, or the historical monuments. Staying in riads provide maximum tranquility even in the midst of the teeming city: Even if you love city life, with its crowed streets and sounds, you typically don’t want to sleep in the middle of it. Since riads were designed to function as miniature fortresses for wealthy Berber and Arab families, they have no outer windows and are entirely inward focused. The benefit of this is that you can sit in the courtyard and hear almost nothing on the outside! You have your own haven from the crazed excitement of the streets. Author Bio: Ethan S. writes on behalf of MoroccoTours.org, a Moroccan travel, lodging, and touring agency that is ready to hook you up with your next adventure!